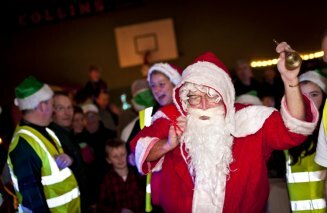 A big thank you to everyone who supported this year's Santa Wonderland in Oxfield. Another fantastic day 'for the community, by the community! 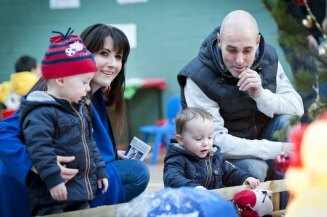 'The all new wonderland grotto was a big hit next year, and we suspect that there will be a big demand for radio controlled cars this Christmas too! Thanks again to all our sponsors and donators. And thanks as ever to our hard-working organising committee and to our brilliant volunteers who always chip in to make these events a success. Finally, thanks to everyone who supported our WINter raffle which was a huge success. We would ask everyone to please keep our prize sponsors in mind when out shopping, buying fuel and dining this Christmas (see right hand list of sponsors). Santa is making a welcome return to Drumcliffe this year, at the magical Oxfield Santa Wonderland event which takes place on Sunday December 14th from 3 to 5pm. Always a hugely enjoyable festive outing for all the family. This year’s event will include traditional fun and games (not a computer game in sight! ), Christmas cinema, kids colouring station, kids LEGO table, kids disco, spin the wheel, radio controlled challenge, great atmosphere, door prizes with a difference, stalls, ye olde shop, refreshments including mulled wine, teas and coffees. The big ‘Oxfield Win-ter Raffle’ will also take place on the day with some great prizes to be won. Admission is €4 per child (which includes a ticket to see Santa in his all new ‘winter wonderland grotto’), max €10 per family, and grown-ups are free.